You would think with this being my third pregnancy that I am a pro by now. Yet I find myself searching Google for all the latest tips and tricks. When it comes to pregnancy, things seem to change fast. Going back to my OB for pregnancy after I had my last baby over 3 years ago, it felt like I was there for the first time. New people, new processes, new tests. Every pregnancy is different too. Just when you think you have it all figured out something you haven’t dealt with yet happens. Enter the best pregnancy hacks. I love a good pregnancy hack. 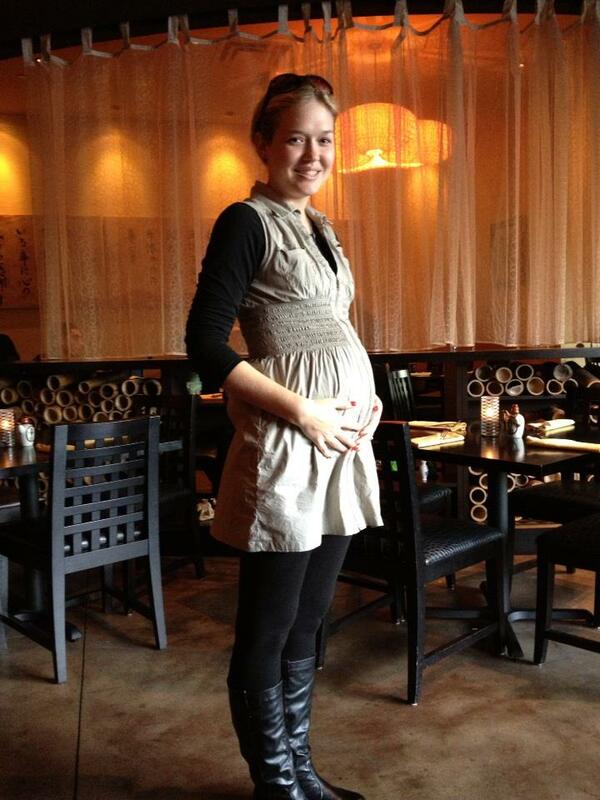 My favorite from my last pregnancy was using a hair-tie to extend the life of my jeans. Put a long shirt over top and you can breathe and still look cute. I thought I was a genius but apparently I didn’t come up with this idea. This third time around I found myself wondering what other new hacks have been discovered that I didn’t know about last time around. 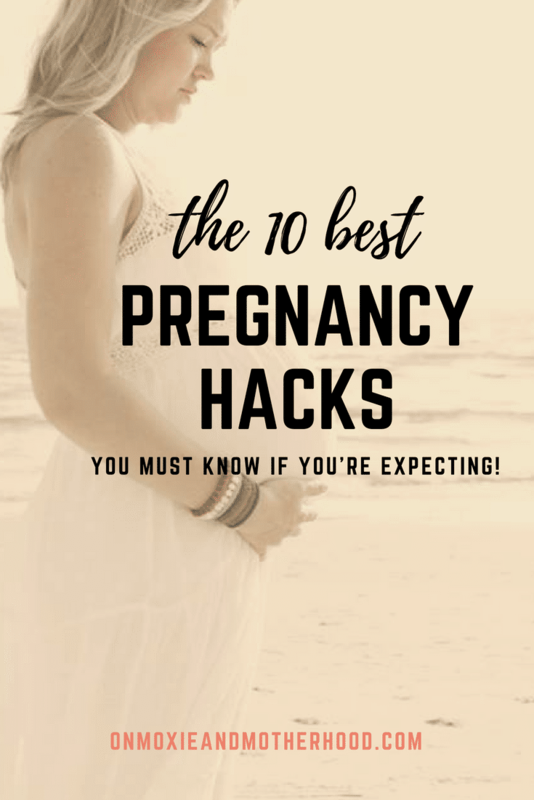 For myself and for all of my current and future pregnant mama friends, I have scoured the internet, jogged my mom-brain, asked my favorite mom groups on Facebook, and Pinterested my heart out to bring you a list of the 10 Best Pregnancy Hacks. Let’s talk stretch marks.Yes, we try to own them once we have them, but I bet we can all agree we feel better if we don’t have to. At the beginning of my first pregnancy my sister told me she had never used lotion during her pregnancies, she just put baby oil on her tummy before she got out of the shower. This sounded right up my alley, because I’m lazy. I started putting baby oil all over my stomach as my last step right before I got out of the shower.My first pregnancy I really focused on my stomach and not so much on my sides/hips. Newbie mistake. Towards the end of my pregnancy I ended up with a couple of stretch marks on my sides, but zero on my stomach. So during my second pregnancy I made sure to apply it all over my stomach and hips. Zero new stretch marks my second pregnancy. My stomach is still stretch mark free, so far. 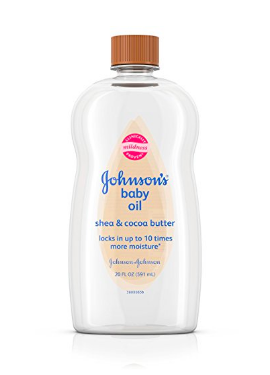 We are ending the first trimester with baby #3, so you can bet I am applying that baby oil fiercely at the end of each shower. Other women have suggested coconut oil, which probably works great too! I like to use the Baby Oil with Shea & Cocoa Butter. 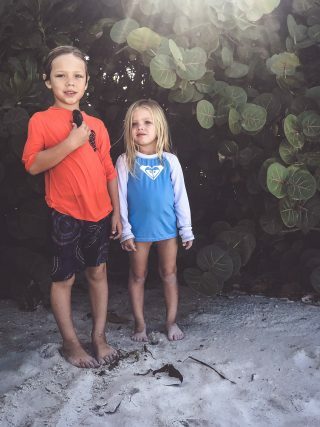 Get dressed without losing your mind.I am guessing I am not the only pregnant mama who has ever walked into her closet, only to walk out empty handed with hurricane-like destruction in my path. It doesn’t have to be this way, my friend. My favorite style pregnancy hack is to turn short dresses into shirts. You can make it cute, comfortable, and avoid buying so many maternity items that you won’t be able to wear post-pregnancy. If you live somewhere warmer like I do (Florida) you can probably also get away with wearing long dresses most of the year. I practically lived in one of these two options my first two pregnancies, and I am quickly headed back there now. I would buy long dresses that were cotton or stretchier materials, so I could make them work with my belly but also wear them post-pregnancy. 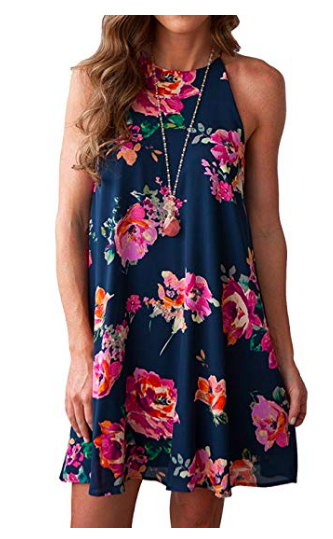 Something like this cute dress, on Amazon for just $15.99, would make a super cute maternity shirt over some leggings and then convert back to a dress option post-baby. Combat morning sickness.Oh the dreaded morning sickness. 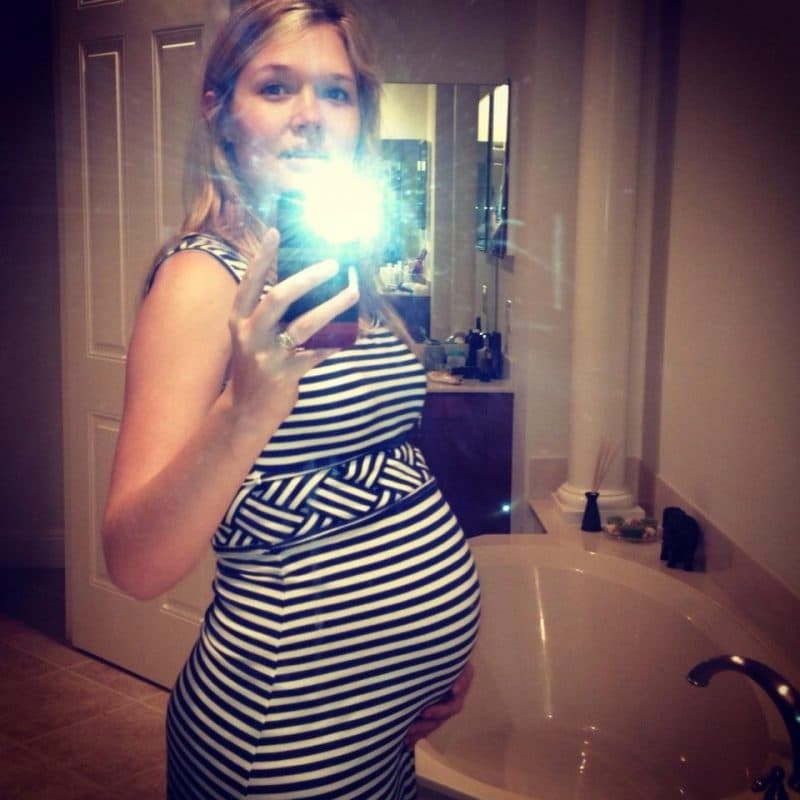 There are so many pregnancy hacks out there for morning sickness. This is a harder problem to solve because the best remedies vary person-to-person. I feel like though, here in my third pregnancy, I have finally found the holy grail of pregnancy hacks. I think I’ve hit the jackpot, the cure for morning sickness. 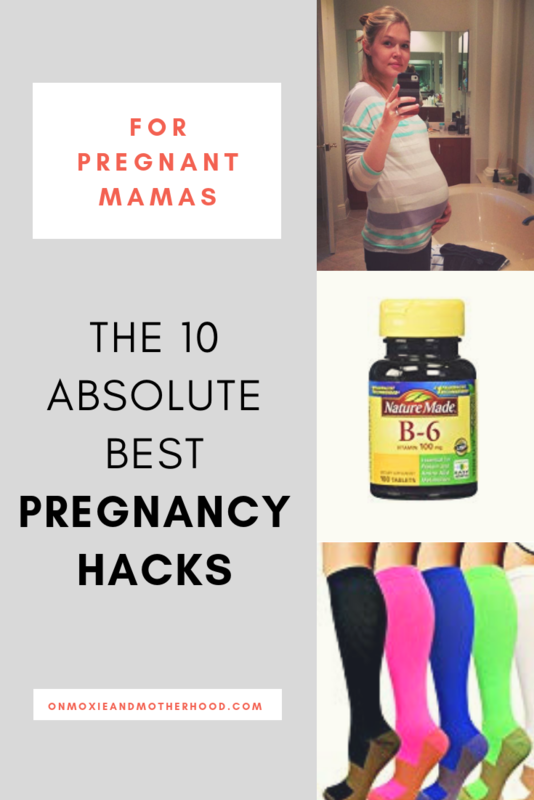 Until someone tells me this does not work for them at all, I will continue to believe this is the best pregnancy hack on earth.Let me start by saying I was horribly sick with my first pregnancy, and even sicker with my second. Forget morning sickness. I had morning, afternoon, evening, night and in between sickness. I tried everything from eating crackers before I got out of bed, ginger ale, preggo pop drops, and every other tip any one suggested, ever. All with little to no relief.I came into my third pregnancy with dread, assuming I was doomed to months of nausea and vomiting. Remember how I said that everything at my doctor’s office has seemed to change in the past 3 years? Well apparently they also learned a new trick: the best pregnancy hack ever. 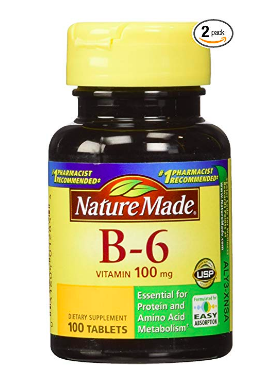 At my first appointment I told my doctor how miserably sick I was, and she suggested I take Vitamin B6 along with half a tablet of Unisom at night, with extra B6 during the day if needed. I’m sure I looked at her like she was a crazy person, because that sounded… weird. I was desperate, but hesitant. 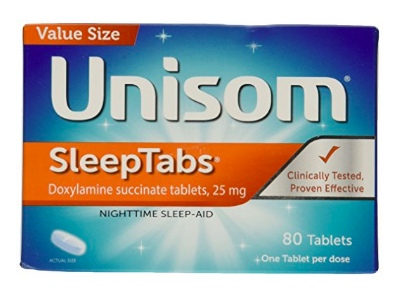 I wasn’t afraid of the B6, but Unisom, a sleep aid? Don’t get me wrong, I wasn’t sleeping well. But, a sleep aid for nausea? Look, I don’t even take a Tylenol unless I’m practically dying. I just don’t like to take medications. Because of my paranoia of medicine, I decided to start with just B6 and see if that helped. I couldn’t find just B6 alone at my local grocery store, but I did find it at a local natural health store, and also on Amazon of course. What I found was that when I took the B6 only I no longer vomited, but I still felt nauseous all the time. That was almost worse, no relief. After talking to several friends and helpful strangers on Instagram who had taken the B6 + Unisom combo, I decided to give it a try. That night I took my prenatal, half a tablet of Unisom, and B6. The next morning…I felt completely normal. Zero nausea. Literally fine. It was a pregnancy miracle. All hail Unisom, the best pregnancy hack I’ve ever found. Turns out, Unisom is diphenhydramine, which is basically Benadryl. It’s safe for pregnancy, non-habit forming, and my new best friend. Just make sure you get the tablets instead of the gels so you can break them in half! Extend the life of your pants.I mentioned this before, but it has to go on the list. Us pregnant mamas need to extend the life of our pants as long as possible. A simple hair tie will do the trick. Just loop it through the button hole and around the button and you’re set. This is a great time to put that short dress on as a shirt. That way you don’t have to worry about lifting your arms and exposing your makeshift pants extender. Winning at pregnant life. If you’re anything like me, you’ll want to go ahead and grab yourself about 500 of these since they apparently have disappearing powers. The dreaded heartburn.Am I the only person on earth who only gets heartburn while pregnant? Please tell me I’m not alone in the comments. Before pregnancy I had never had heartburn in my life. Post-pregnancy I never get heartburn, well until I’m pregnant again. If you get it all the time and hate me now, don’t worry I suffer my dues during pregnancy. The first time I thought it was for sure a heart attack and almost went to the ER.Randomly, the thing that helped me most with my heartburn was Fritos. Yup, plain Fritos. I believe my sister-in-law gave me this tip, so I definitely want to credit her if she did. If you’re reading this Jen, and you didn’t tell me that, blame it on the terrifying combination of pregnancy brain and mom brain. If you’re suffering from pregnancy heartburn, go get yourself some Fritos. I swear this pregnancy hack worked wonders for me.I think this is one of those pregnancy problems that has varying remedies per person, so you may have to try a few things to find what works for you. If my beloved Fritos don’t do the trick, some awesome moms in my favorite mom group on Facebook suggested organic apple cider vinegar, aloe vera juice, and papaya enzyme. I am too early in my third pregnancy to suffer the torture of heartburn yet, but I’ll be testing these pregnancy hacks once it strikes. Sleeping on your stomach.One of my least favorite things about pregnancy is not being able to sleep on my stomach. I sleep in the same exact position every night: left leg straight down, right leg pulled up, on my stomach. I have slept like this my entire life, so to tell me that during the most uncomfortable time in my left that I cannot sleep in my most comfortable way because I will squish my offspring, it’s rough I tell ya.During my first pregnancy I had a pregnancy pillow that at least allowed me to sleep more comfortably on my side with one leg up. 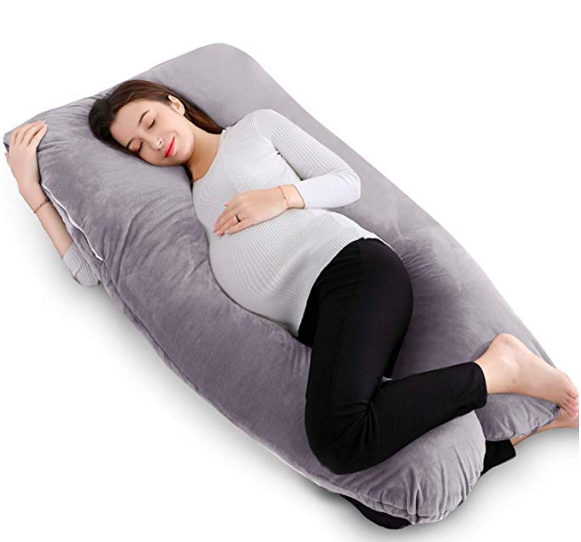 For my second pregnancy I used just a regular body pillow and it worked the same for me. I’ve since talked to some moms who are much smarter than me, who came up with the genius idea to space out four pillows in a square and lay on top of them so they could sleep on their stomach. Pretty smart. I haven’t personally tried this one yet, but it sounds like a pretty genius pregnancy hack. Alleviate Back & Ligament Pain.I have seen all sorts of braces and wraps to alleviate the pain that starts as your pregnant tummy starts getting larger and pressuring your back and stretching your ligaments. 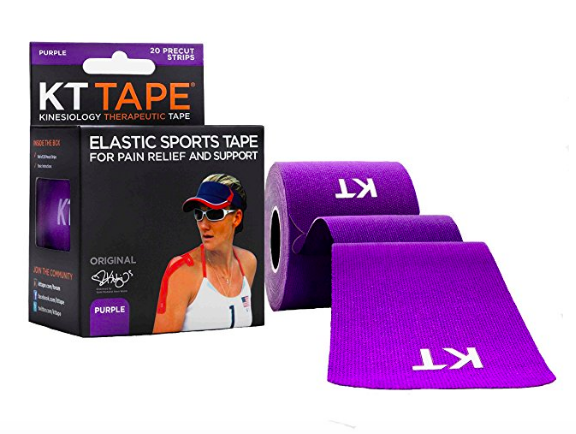 One of my favorite pregnancy hacks which is easier and cheaper, is KT Tape. Tape that belly up! This pregnancy hack is not only more comfortable, but it’s less sweaty and more comfortable overall. Stop those awful leg cramps.Leg cramps are the worst. I remember being awoken several times during the night with my first pregnancy with awful cramps in my legs. As if we need any help not sleeping. I found relief from bananas and electrolyte water, but have since heard of Cal-Mag. 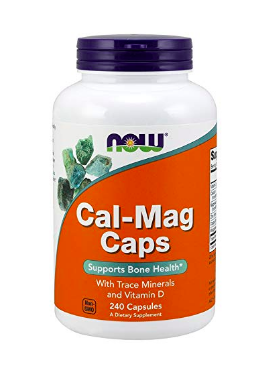 According to reports from fellow mamas, Cal-Mag works wonders for leg cramps. It doesn’t stop there though, apparently Cal-Mag is your new best friend. 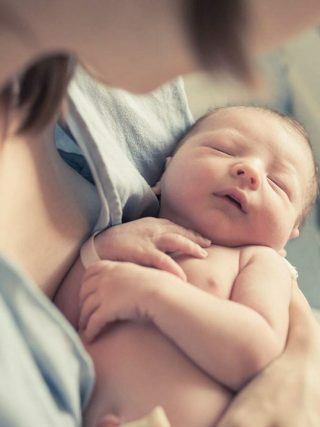 It’s been claimed that it can aid with sleeplessness, help in prevention of preeclampsia, and calm your nerves. Sign me up for that! Sounds like an awesome pregnancy hack to me! Reduce Swelling.I don’t know about you, but in my past two pregnancies the swelling was real. I felt like the Goodyear Blimp towards the end. My feet ached and it’s no wonder, I couldn’t see them. The swelling in my ankles was, well, let’s just say I no longer had ankles. 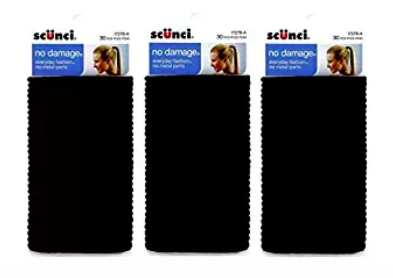 They were just gone.My favorite pregnancy hack for swelling relief? 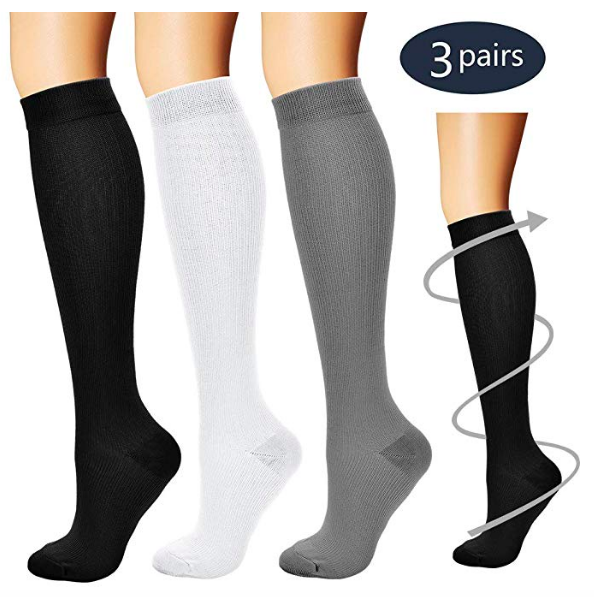 Compression socks. Especially if you’re going to be sitting for long periods, which I don’t recommend. Sometimes we can’t avoid it though. This pregnancy hack will help alleviate swelling and pain, and therefore overall loss of sanity. Other things that can help include moving around frequently, eating healthy, avoiding too much sodium, and staying hydrated. 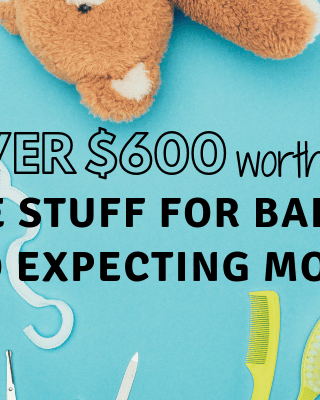 How to not freak out.This pregnancy hack is not a product you can buy, but I think it’s one of the best pregnancy hacks I can share with you. The fear during pregnancy is real. The first time you are scared because it’s all new and you have never been through it before. All the times after that you are scared because you have been through it and you know what’s coming for you. Pregnancy is just scary, no matter how many times you’ve done it.After going through two pregnancies and two all-natural unmedicated labors I can tell you that the best thing you can do is stop over-thinking everything. This is a bold statement from the queen of over-thinking herself, but it’s important. You can over-analyze every single bit of pregnancy, labor and delivery but it’s not going to change anything. It’s still just going to come, and you are going to get through it, and then it’s going to be over.A lot of people don’t know this, but I have never taken a pregnancy class, labor class, breathing class, none of it. Yet I survived two natural labors with zero pain medication. How? I constantly reminded myself that I was made to do this. Our bodies were made to create life, and they know just what to do. Long before pregnancy hacks, epidurals, and lamaze class, women were having babies. Now I’m not knocking any of those things, we are blessed these days to be able to do pregnancy and labor more comfortably and safely with advanced medicine. I say whatever is safe and will make you more comfortable and happy, go for it. However, the reason I didn’t take the classes and read the books was because I was already stressed out enough without giving myself more ideas of things to be stressed about, or things I had to do perfectly in my own mind. Whenever I started to feel panicky about labor or delivery I took a deep breath and reminded myself that women do it every single day and they are still around to tell about it. Remind yourself you were meant to do this. Take a deep breath. 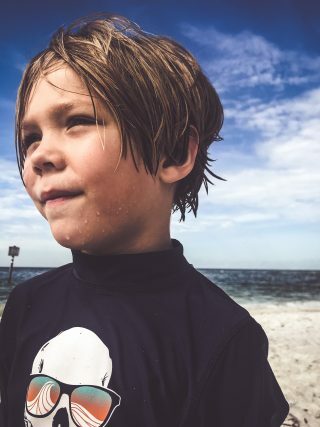 You are creating a human being, and that is pretty awesome. Women do this every single day, because we are strong and meant to create life. There will be really hard moments, and then they’ll pass. You’ll be just fine. You’ll actually be better, way better. 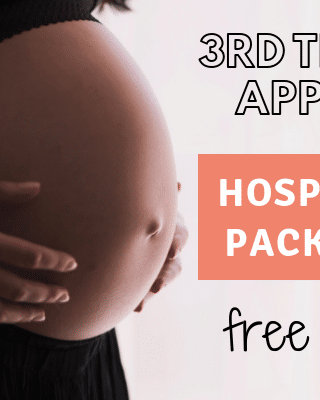 If you try any of these pregnancy hacks and they work for you, or if have any awesome pregnancy hacks I would love to hear them! Leave a comment and let me know!